Dinosaurs aren’t known for their drawing – they’re known for their stamping and stomping and ROARING! All except for one creative young dinosaur who just can’t seem to stop! He transforms rocks, chalk, sticks and mud into the most wonderful works of art – much to the confusion of his fierce, fighting dinosaur family. But when everyone hears the THUD of a terrifying T-Rex, they soon see just how effective art can be. Especially art in the form of an even bigger dinosaur! Another brilliant rhyming story from this exciting pairing; author, Elli Woollard and illustrator, Steven Lenton. A vibrant and uplifting story about the joy and the power of art – and daring to be different. 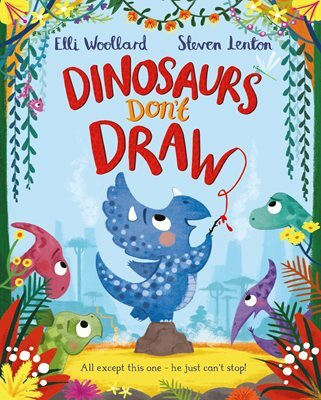 Dinosaurs Don’t Draw is a visual treat and a delight to read aloud.